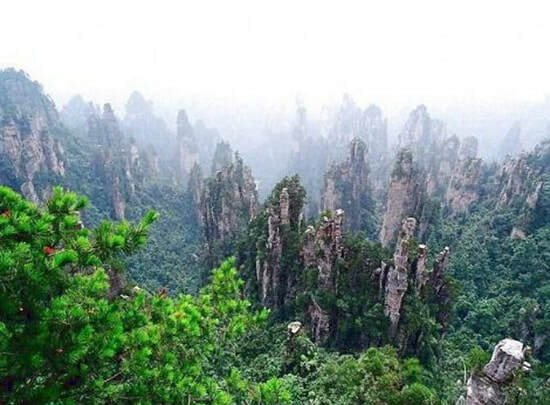 Located in the northeast of Zhangjiejie National Forest Park, Yaozizhai Mountain is around 1,050 meters tall. Few of visitors, especially Chinese tourists, explore the mountain due to its steepness. Yaozizhai Mountain is situated in Zhangjiajie National Forest Park. It takes about 6 hours to hike the whole tour route to the mountain. There is no other transportation method except with foot to explore the mountain. The trails here are very characteristic. There are "mushrooms", "footprints", "quincuncial piles" and "staff" made of stones. What is more distinctive is that the attractions here were all named by the Generals of the Chinese People's Liberation Army. Yaozizhai Area is the largest scenic area in Wulingyuan with the most scenic spots and the most tour routes. Yaozizhai offers five tour routes, including Baiying Valley, Top of Village, Pine Ridge, Dove Tree Bay and Valley of Flowers, with more than 100 attractions. Attractions such as the Heaven Bridge, Laoyingzui, the Rabbit Looks at the Moon and so on have long been famous overseas, while more than 80 new spots in the area are newly open to visitors, such as Paishan Daohai, Lingkong Jinghun, Shenxian Cave, Bihai Songhua etc. If you are planning to visit Yaozizhai for photography purposes, you can visit it around the year as it presents different stunning views in 4 seasons. Generally speaking, it is recommended that you visit it in April, May, September and October for the four months are not too hot or too cold. Yaozizhai Mountain is closest to National Forest Park Ticket Station. After entering the station, walk forward for 5 minutes. Arrive at Oxygen Square (氧吧广场). Continue walking by the big iron concentric lock and you will see the gate of Yaozizhai. There are the tourists bus from Zhangjiajie Bus Station to National Forest Ticket Station. Therefore, there are several options. Rent a car from Zhangjiajie airport, Zhangjiajie Train Station or Zhangjiajie Bus Station to the National Forest Park Ticket Station. This is the quickest and most direct option. As Yaozizhai is located in Zhangjiajie National Forest Park which is part of Wulingyuan Scenic Area, visitors can enter the the park from National Park Ticket Station with the pass ticket for Wulingyuan Scenic Area. The pass ticket is valid in four days from the date when you get it ( For example, if the ticket is issued at 13:00 on Monday 9th July, 2018, the ticket is valid by 13:00 on Friday 13th July, 2018). You could take a complimentary eco-friendly car with the pass ticket. With the pass ticket, you can visit all the four scenic areas mentioned above and can enter the Wulingyuan from one of five entrances at the five ticket stations. After entering the ticket station, walk forward for 5 minutes. Arrive at Oxygen Square (氧吧广场). Climb the stone steps on the left. If your condition is unfit for climbing, please take the shuttle bus in the area with your pass ticket to the lower station of the cable car for Yellowstone Village. Interested in visiting the Yaozizhai on a Tour? Wendy Wei Tours offers a variety of different packaged tours as well as custom tours including the Yaozizhai, among other attractions and destinations. To find out more, please visit our Tours page or Contact Us directly to find out more.